1959 NE Pacific Street, F-262 Health Sciences Bldg. The Department of Epidemiology is easy to reach by foot, bicycle, bus, light rail, or car. For those walking in the UW neighborhood, check the searchable map to the UW campus. For those cycling, the UW bike space page offers good maps and other route planning assistance. A special asset is the Burke-Gilman multi-use trail, one of the nation’s great rail-to-trail projects. The trail passes through campus, just across NE Pacific Street from our Magnuson Health Sciences Center, and foot bridges connect the trail to our building. There are numerous bike racks just off the trail and throughout the UW campus. Come south down Rainier Vista and circle right around Drumheller fountain, heading down the sidewalk closest to the chemistry building (Garfield Lane). Cross the overpass closest to UW Medical Center. Proceed through 4th floor T-Wing lobby area. Turn right at hallway. Turn left almost immediately at first hallway (Signs direct you to South Campus Center and F-Wing, School of Public Health). Proceed to end of hall—Department of Environmental Health, 4th floor of F-Wing. Proceed to 2nd floor via stairs or elevator. Once you arrive on the 2nd floor, you'll find signs directing you to the administrative offices. You can take Link Light Rail directly from the Seattle Tacoma International Airport to the University of Washington in roughly 50 minutes, with stops along the way to Pioneer Square, Downtown Seattle, and Capitol Hill. Taking the northbound light rail, you'll want to get off at UW/Husky Stadium stop. The stop is just across from the Magnuson Health Sciences Building/UW Medical Center on NE Pacific Street. head down the third floor corridor until you reach the F Wing. Our offices are on the 2nd floor of the F-Wing. Our School is served by many bus routes. The closest stops to the Magnuson Health Sciences building are along NE Pacific Street (stop 29240, serving many routes) and along Stevens Way (stops 75417 or 75404, depending on your direction of travel, serving many more routes). Find your most convenient King County bus route by searching on the King County Metro trip planner web page, where you can enter our stop “NE Pacific St & NE Pacific Place”. You can get real-time bus information via the web, phone, text or smartphone through OneBusAway. There is free UW shuttle service between campus and the Fred Hutchinson Cancer Research Center, and between campus and Harborview Medical Center, where some of our Global Health offices are. It’s easy to get around by bus! Uber and Lyft both operate in the Greater Seattle Area and are available for transport from the airport to the UW. The Magnuson Health Sciences Building's address is 1959 NE Pacific Street, Seattle 98195. The Department of Epidemiology administrative offices are located on the second floor of the F-wing in the Health Sciences Building. The S-1 garage is the most convenient parking area. The S-1 garage is directly behind the Magnuson Health Sciences building. Access the garage through Campus Gatehouse #6 by driving to the end of 15th Ave. NE and curving left onto Columbia Road. Gatehouse #6 will be straight ahead. When you reach the gatehouse, ask to park in S-1. You will need to pay to park (see Visitor and Guest Parking). If the gatehouse puts you in a lot other than S-1, call the School at (206) 543-1144 for help with directions. From the uppermost underground level of S-1 garage, enter the "-1" tunnel and follow signs to the Dental Clinics. After entering the F-Wing, the hallway will jog right and then left. On the left are elevators (don’t turn right toward Dental Clinics). Proceed on elevator to 2nd floor. Turn right and follow hallway to Epi Administration Office, F-262. From the street level, proceed up the stairs on either side of the F-Wing. Entrance to the building is on the 2nd floor, where our offices are located. Follow signs to the Department of Epidemiology Administration offices. The University of Washington is committed to providing access, equal opportunity and reasonable accommodation in its services, programs, activities, education and employment for individuals with disabilities. To request disability accommodation contact the Disability Services Office at least ten days in advance at: 206.543.6450/V, 206.543.6452/TTY, 206.685.7264 (FAX), or e-mail at dso@u.washington.edu. 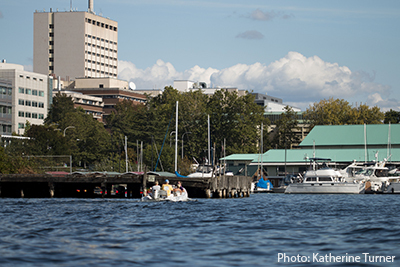 For visitors with disabilities, see UW access guides and mobility maps and information about disabled parking on the UW campus. Our Magnuson Health Sciences building and offices are handicapped accessible.